Author’s note: In a Banished to the Pen exclusive, we teamed up with Nolan Arenado’s stellar glove to answer fan questions on names, offseason plans, the Dodgers, and much more. 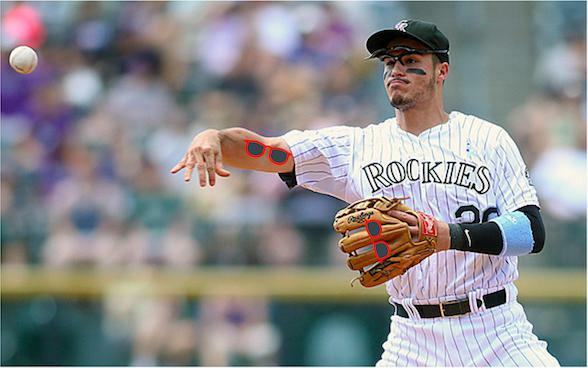 Most of you know me as Nolan Arenado’s glove. Since I’ve been in the Bigs, I haven’t really said much. I just go about my business one out at a time. Let the game take care of the talk. Real G’s move in silence and all that. But me, Nolan, and his arm have been getting a lot of attention lately. I think it’s because people are seeing more of us now that we’re in the thick of the playoff race. That’s fine by us. In any case, we’ve received a ton of fan mail, and let me just say, it’s not necessary, but it’s greatly appreciated. It’s weird when people all over gush about us because, frankly, we think what we’ve been doing is pretty ordinary. I mean, for us I guess. It’s not a big deal. Anyway, since we gotta gear up for a postseason run, I thought I’d put my daily web massage off for a few and answer some questions. I don’t expect to have a lot of time to do this until after October, so I figure I’d get a few of these out while I still can. I saw you the other day! Do you have a name? Hey Malcolm, thanks for watching. Come to the ballpark again on September 15th, we’re giving out rally towels. They’re really cool. Anyway, only Nolan and his arm know my real name, and that’s gonna have to stay between me and my boys. It’s a glove thing. but when we play the Giants, we pretend my name is Parker to remind Buster who the better Posey is. What do you, Nolan, and his arm call yourselves? Do you have a superhero group name or something? You should. Thanks for writing in, Stacy. 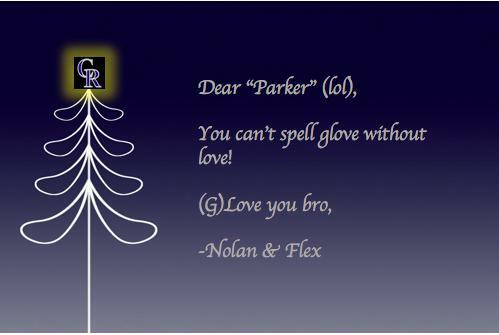 First, Nolan’s arm’s name is Flex Pérez. Nolan told me Flex chose that for himself. Second, we call ourselves The Arenabros. It’s not a big deal. How can I be more like you guys? Hey Dan. I don’t know, wear sunglasses probably. We do during day games. I’m frickin’ sick and tired of Castellanos, dude! And now that he’s trying right field, I gotta deal with everyone thinking his defense was my fault? Pretty sure I’ll be unemployed soon. You HAVE to get me out of here, you’re like the King of third base gloves. Got any room for me in Denver? I’m happy with warm-ups. Sorry bro, this line is mine. Do you hang out with any other third base gloves? Hey Deena, thanks for the cookies, they were great. To your question: I’m in a group chat with a few of these guys. It’s called, “Hot Corner, Cool Leather”. Otherwise, there really isn’t a lot of time to hang out during the season, but we usually go tanning in the winter. Flex is good friends with Mrs. Miami. That’s Machado’s arm. I’ve always wondered what players talk about when they meet up on the bases. Like, what do guys say to Arenado if they make it to third? And do the other NL West guys talk much? Hey Ken. Not a lot of guys make it to third on us, but if they do, the players usually just talk about random catch-up/social activity stuff. “How’s the family?” or, “Where’s a good place to eat?” That kind of thing. The West guys are usually chirpy. Except Buster, he’s pretty boring. The only time I ever heard him say anything interesting, it turned out he was rehearsing lines for a commercial. As for me, infield gloves and batting gloves don’t really get along, so there’s not much chit-chat going on there. So what do you REALLY think of the Dodgers and their all-world third baseman? They’re all right. He’s all right. Rockies in three. How much time do you spend admiring your gold gloves? Hey Carla, thanks for writing in. The gold gloves don’t look anything like me, so, not much. After this article came out, did you guys talk about it? Did you even read it? If you haven’t, here’s a summary: you’re just a tool to Arenado. How does that make you feel? They’ll probably get mad I shared that with you guys, but it’s for the fans, so it’s no big deal. See you guys at the park during our run. We’ll talk again after the parade.